A slick, big-budget Russian sci-fi film from director Fedor Bondarchuk, Attraction begins with a meteor-shower passing over Moscow which causes an alien spaceship - silently observing the Earth in order to assess our worthiness as candidates for first-contact - to crash-land in the city. As the military swing into action, citizens begin to panic, and we're witness to the aftermath of this historic event. 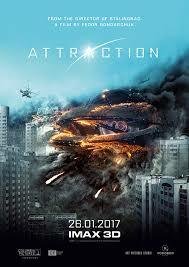 Attraction is a sort of ensemble-piece, following the lives of high school student Yulya (Irina Starshenbaum), Yulya's boyfriend Artyom (Alexander Petrov) and her father, Colonel Lebedev (Oleg Menshikov), who happens to be in charge of the military operation to secure and explore the crashed ship. It must be said up-front, Attraction is a flawed film. It's baggy narrative, derivative style, and two-dimensional characters make watching the film a bit of a chore. Having said that, it's heart is in the right place. Probably. Try to imagine for a moment that Roland Emmerich and Neill Blomkamp co-directed an alien-invasion film together, a bizarro mash-up of Independence Day and District 9, and you start to get the idea. The film contains all the cliches, bad jokes ("You should have crashed in Finland. "), hammy acting and melodrama of an Emmerich disaster flick, but attempts to alleviate this inherent cheese through aping the grit and grime, social commentary, and, during scenes of action, the intense, chaotic camerawork, of a Blomkamp film. It doesn't do a very good job. Watching the film is actually quite a curious experience. It's obvious that the producers were aiming for something epic, something which might have international appeal, and so they've ensured that all boxes are ticked: Great big action, family in conflict, romance, bio-mechanical suits of armour, jets and helicopters everywhere, and an ending (more of a series of endings really) which, in theory, ought to leave everyone smiling. However, filter this through the lens of Russia's film-making industry and it's as though they just can't quite circle the square of a Hollywood-style film. Everything about Attraction feels slightly off-kilter, as though the experiment has gone wrong and the apparatus is going heywire. The ill-fitting mix of humour, human drama, special-effects and brutal violence does not make for a satisfying film with an even tone. Men stare at computer screens, looking concerned, Yulya discovers and bonds with a hunky humanoid alien called Hijken (Rinal Mukhametov), who looks like he's stepped out of a fashion magazine, Yulya's gangster boyfriend becomes insanely jealous, citizens riot for no apparent reason, her father is furious (also for no reason), more helicopters, more jets, soldiers with big guns and shiny boots, a dubious McGuffin, a tedious showdown at the crash site during an extended third act... And the message is: Can't we all just get along? At 130 minutes Attraction feels bloated, directionless, at once cynical and naive. Had the film been shorter, perhaps removing a few unnecessary subplots, its approach to the material might just have worked. Had it been 85 minutes long, I could see this film as a nice, if rather goofy little sci-fi, destined to find a cult following, but by passing this off as something significant and grandiose, by offering a quasi-philosophical message on humanity's unreasonable prejudices, while also making sure the family dog doesn't die, the film simply falls apart under the weight of both its own ambition and lack of nuance. No film can be all things to all people (okay, RoboCop, obvious exception). I like sitting down to watch a dumb, action blockbuster, and I also enjoy a more thoughtful or off-beat indie sci-fi. You can't do both, Russia, you can't do both. Everybody likes money, and everybody likes achieving artistic respectability, and while these things may not be mutually exclusive, you need one hell of a film to get there. This isn't it.